Twin sisters Anairis and Adairis Miranda Leyva, their brother, Fidel Manuel Batista Leyva, and their mother, Maydolis Leyva Portelles, all human rights defenders, were arrested on 27 November 2016, two days after the death of Fidel Castro for allegedly leaving their house during the period of state mourning. The initial arrests took place in Holguín and coincided with an “act of repudiation” (acto de repudio), a government-led demonstration that is common in Cuba, carried out at the family’s home. The family are government critics, known for their activism and associated with a number of political and human rights movements including Movimiento Cubano de Reflexión (Cuban Reflection Movement). According to Maydolis Leyva Portelles, currently under house arrest, there were many non-uniformed state security officials, including political police and military officials, present during the arrest. Maydolis Leyva Portelles and her children were charged under Article 204 of the Penal Code, which criminalizes defamation of institutions, organizations and heroes and martyrs of the Republic of Cuba, and with public disorder. On 13 January, a court of second instance upheld a one-year prison sentence for all three siblings, but allowed their mother to carry out her sentence under house arrest in order to care for her grandchildren, Adairis’ children. According to their mother, the three siblings began a hunger strike on 7 March, the day they began serving their sentences and were imprisoned. The siblings are currently being held in three separate hospitals in critical condition. Doctors informed their mother that Adairis is at risk of a heart attack and that Fidel is urinating blood; and that all have lost significant weight. On her last hospital visit, Maydolis Leyva Portelles says that she was asked to sign a document which would authorize doctors to force feed her three children, which she refused to do. She told Amnesty International, “I don’t want any of my children to die, but I want to respect their wishes.” All three siblings and their mother are prisoners of conscience and must be released immediately and unconditionally. Calling on them to refrain from using measures to punish hunger strikers or to coerce them to end a hunger strike, which would be a violation of their right to freedom of expression. Urging them to provide the siblings with access to qualified health professionals providing health care in compliance with medical ethics, including the principles of confidentiality, autonomy, and informed consent. According to its webpage, El Movimiento Cubano de Reflexión is a non-violent organization which aims to mobilize Cuban citizens to bring about social change. Article 204 of the Cuba Penal Code criminalizes “defamation of institutions, organizations and heroes and martyrs of the Republic of Cuba.” (Difamación de las instituciones y organizaciones y de los héroes y mártires). Under the law, anyone who publically defames, denigrates or disparages institutions of the Cuban Republic, or political organizations, or heroes or martyrs of the homeland, risks sanctions of deprivation of liberty of three months to a year or a fine. Under international law, the use of defamation laws with the purpose or effect of inhibiting legitimate criticism of the government or public officials violates the right to freedom of expression. 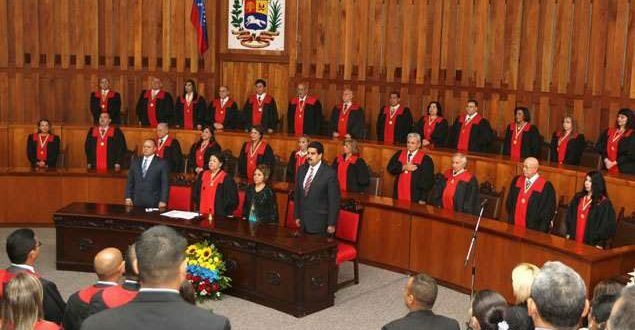 Venezuela has been a dictatorship for sometime under the Maduro regime and the Venezuelan judiciary has not been an independent body for years meaning that the rule of law has long been absent. 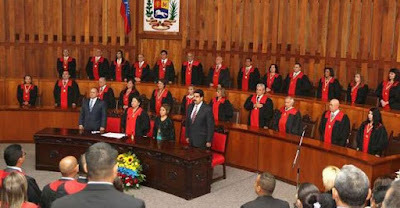 Therefore the decision of the Venezuelan Supreme Court to strip the powers of the Venezuelan National Assembly and repeal the immunity of its members while further expanding the powers of the executive should come as no surprise. Venezuelan democrats have been under fire for years. Many, like Leopoldo Lopez, have been unjustly imprisoned. Nor is the continuing downward spiral into greater misery for Venezuelans a surprise because it is the natural outcome of "21st Century Socialism" which bears a striking resemblance to 20th Century Communism. We are witnessing in the tragic developments in Venezuela the fruits of Secretary of State John Kerry's diplomatic strategy in that South American country. 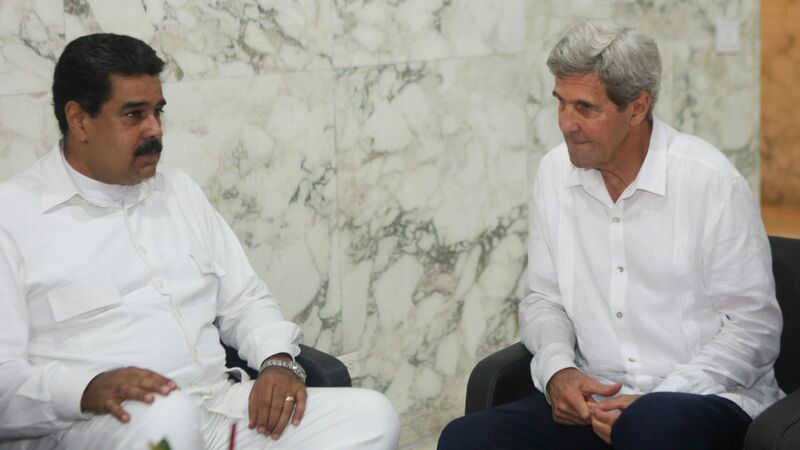 It was Secretary Kerry who said on August 20, 2015 that "the United States and Cuba are talking about ways to solve the Venezuelan crisis." This implied that the U.S. was on board with Maduro continuing in power in Venezuela while trying to find ways to stabilize the country. 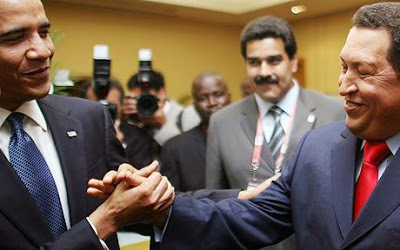 President Obama early on in his presidency began his outreach to the Venezuelan regime of Hugo Chavez and the Cuban regime of the Castro brothers. Hopefully this approach will change with the new administration in the White House and there is reason for hope as democracies in the Americas have finally spoken up to express their alarm with the course of action take by the Maduro regime. Let us pray that this will not be another case of too little, too late. Joachim Løvschall was studying Spanish in Havana in the spring of 1997. He was gunned down by a soldier of the Castro regime in Havana, Cuba twenty years ago today on March 29, 1997. The identity of the soldier has never been revealed to Joachim''s family. No one has been brought to justice. Joachim's family is not satisfied with the official explanation. On March 28, 1997 Joachim Løvschall ate his last dinner with white wine in a little restaurant called Aladin, located on 21st street in Havana. He went to the Revolutionary Plaza and bought a ticket to the Cuban National Theater. Following the performance he went to the theater's bar, Cafe Cantate, and met up with two Swedish friends. They each drank a couple of beers, but soon left because Joachim did not like the music. At 23:30, they said good bye to each other on the sidewalk in front of Cafe Cantate. Joachim was never seen alive again. Around 23:30, a person matching Joachim Løvschall's description was in a bar named Segundo Dragon d'Oro. The bar lies in the hopeless part of town, around the Revolutionary Plaza which is dominated by ministry and other official buildings of harsh concrete architecture, and lies empty in at night. At 2:45am he left the bar, after becoming intoxicated. Around 20 minutes later, he was walking down the Avenue Territorial, behind the Defense Ministry. Joachim Løvschall walked, according to the Cuban authorities, first on the sidewalk that lies opposite the Ministry. Midway he crossed over to the other sidewalk, considered to be a military area, though it is not blocked off. The Cubans have explained that Joachim Løvschall was shouted at by two armed guards, who in addition fired warning shots, which he did not react to. Therefore, one guard shot from the hip with an AK-47 rifle. The first shot hit Joachim in the stomach and got him to crumble down. The second shot hit slanting down the left side of the neck. "Although the killing took place on the 29th of March, we only came to know about it on the 6th of April - i.e. after 8 days were we had the feeling that the Cuban authorities were unwilling to inform anything about the incident. Only because of good relations with Spanish speaking friends in other Latin American countries did we succeed in getting into contact with the family with whom Joachim stayed and the repeated message from their side was that they could reveal nothing, but that the situation had turned out very bad and that we had to come to Cuba as soon as possible. At the same time all contacts to the responsible authorities turned out negatively... Only after continued pressure from our side on the Cuban embassy in Copenhagen, things suddenly changed and the sad information was given to us by our local police on the evening of the 6th of April. 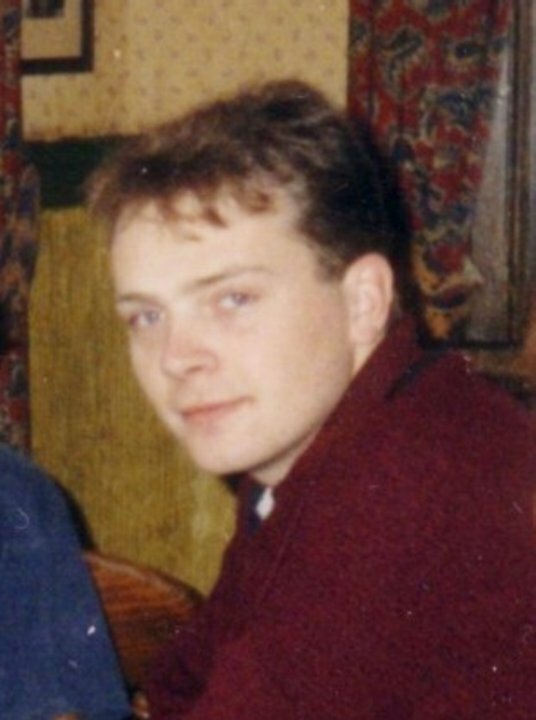 We are, however, 100% convinced that had we not made use of our own contact and had we not continued our pressure on the embassy in Copenhagen, we might have faced a situation where Joachim would have been declared a missing person, a way out the Cuban authorities have been accused of applying in similar cases." We do feel we were (and still are) left with no answers except to maybe one of the following questions: Where, When, Who, Why Starting out with the where we were told that Joachim was killed by the soldiers outside the Ministry of Interior. Despite the claims made by the travel industry there have been other travelers to Cuba who have been killed or gone missing under suspicious circumstances. Christian Democrat Organization of America (ODCA) in Spanish represents 34 political parties that span the Americas. ODCA issued the following statement today demanding the release of its Vie-President in Cuba Eduardo Cardet. The leader of the Christian Movement for Liberation (MCL) and ODCA Vice-President, Eduardo Cardet, was recently convicted by the Cuban authorities of three years in prison accused of "assault on authority." The opposition leader had been beaten and detained, during Fidel Castro's funeral proceedings, on November 30 in Holguín province. We demand the immediate release of Dr. Eduardo Cardet, leader of the Christian Liberation Movement and Vice-President of ODCA, who has been leading a social and political movement that nonviolently struggles for democracy and more freedoms for Cuba. 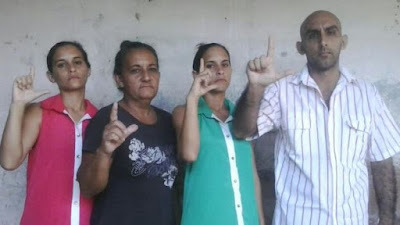 We understand that this new impulse to repress political dissidence is a mechanism to intimidate the Christian Liberation Movement (MCL) and block the initiative "One Cuban, One Vote" that they presented to the National Assembly of People's Power in Havana. 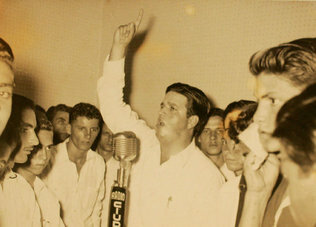 ODCA reiterates its historic position in favor of respect for the human rights and public liberties of Cuban opponents seeking to peacefully promote a process of democratization in Cuba, a struggle historically promoted by Christian Democratic leaders such as Oswaldo Payá, who died in 2012 under circumstances not clarified, and led today by Eduardo Cardet. ODCA denounces the practices of the Cuban State that violate human rights to repress and frighten political dissidents and humanitarian organizations, including beatings, threats, surveillance, harassment, arbitrary detentions, summary trials that do not comply with the principles of due process, and imprisonment. Three months ago, the international community celebrated the 68th anniversary of the Universal Declaration of Human Rights with the favorable vote of Cuba and 47 other member states. In that context, we reiterate the call for Cuban authorities to respect human rights, civil and political liberties and the physical integrity of dissident political leaders, as mandated by that international commitment. ODCA joins Amnesty International's demand for freedom, which has declared our Vice President Eduardo Cardet "a prisoner of conscience" for being imprisoned "solely for the peaceful exercise of his right to freedom of expression." At the same time, ODCA issues a call for subscribing of the MCL Campaign "Freedom and Life for Eduardo Cardet". Finally, ODCA reaffirms that the right of all Cubans to decide freely and sovereignly the future of their country is the only way to move towards a tolerant, plural, free and democratic Cuba. Travellers told Global News they had little or no fresh water for their entire trip to the resort, making it impossible to flush toilets, take showers or wash their hands. Some, like Donna Carvalho of Georgetown, Ont., returned to Canada and went almost immediately to hospital with severe diarrhea, vomiting and an excruciating headache. Carvalho was placed in isolation for five hours and released after she said doctors concluded she had likely become ill from unsanitary conditions at the resort. Carvalho said she witnessed the hotel restaurant using a “dirty rag” to clean dishes, cutlery and glassware in lieu of a dishwasher. Other travellers described similar nauseating experiences. The Canadian government has said that the ill served tourists, many of whom returned home very sick can sue the travel agency. It is not only Sunwing that needs to worry about a lawsuit but also the British based Thomas Cook travel agency. James and Kathryn Longhurst booked their dream honeymoon to Cuba for a two-week all-inclusive getaway in Paradisus Rio de Oro in Holguin, Guardalavaca that cost the newlywed couple $6,235. Three days in, Mr Longhurst fell so ill his tongue turned black. 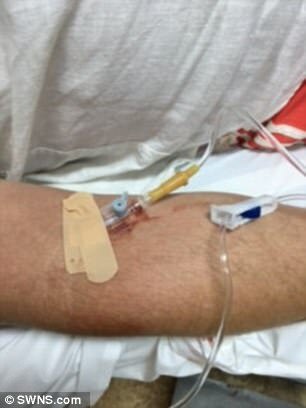 He was rushed to the hospital, where he was given injections and put on IV drips. Returned home and continued to feel ill. They are now suing Thomas Cook. Mrs. Longhurst also became ill. The newlyweds cited "filthy conditions" as the cause of the illness observing in a March 23rd article in The Sun that "dining restaurants were poorly kept with food not “covered properly”, “insects and birds” flying around the buffet area, staff not wearing gloves while handling food and the same utensils used for different dishes." Tourism was supposed to be a magic bullet that would help to open up Cuba, but the reality has been more of a mixed bag with some unexpected downsides for everyday Cubans while strengthening the most repressive elements in the island. However at the same time tourists visiting the island on more than one occasion have encountered the real Cuba that the Castro regime spends considerable resources trying to conceal from outsiders. Nevertheless news accounts emerge that should give prospective visitors pause. It is true that tourism provides hard currency to the Cuban military, that runs the tourism industry on the island shoring up the dictatorship, but not expected was that it would also generate food shortages among everyday Cubans as The New York Times reported on December 8, 2016. Foreign tourists misled by travel agencies can seek justice and exercise their rights back home, but not in Cuba. Meanwhile Cubans have less access to food while the military and the Castro regime get richer off of foreign tourists prolonging the life of the dictatorship. Las Tunas, Cuba: Yoerlis Peña Ávila on March 15, 2017 received a death threat against him and his grandmother, Sirley Leon Aguilera, for being family (son and mother respectively) of Sirley Avila Leon, who was the victim of a May 24, 2015 machete attack carried out by a regime collaborator that left her permanently disabled. The threat is in response to her legal demand presented to recover 126,000 Cuban pesos ($4754) in damages resulting from the attack. On March 15, 2017 he was able to send an e-mail to his mother that described what had happened that same day: "I was working and a man that I do not know told me that it was better that the legal demand not be continued because you did not know the risk in which you were exposing me and my grandmother that for you to suffer they could attack us." Four days earlier on March 11, 2017 Sirley Avila Leon had contacted her son, and again on March 13th on both occasions they discussed the legal action being pursued, but then found it increasingly difficult to communicate. It appears that the Castro regime does not want this legal action to be pursued and is using intimidation to try to shut it down. There is good reason to be concerned with this pattern of threats and harassment. Over a three year period (2012 - 2015) regime agents made a series of threats and took actions that culminated in the attempted murder of Sirley Avila Leon on May 24, 2015. Another round of threats and harassment when she returned to Cuba on September 7, 2016 following medical treatment in Miami led to her decision to leave Cuba on October 28, 2016 and request asylum in the United States when death threats against her person escalated and her attacker, Osmany Carriòn, was free and bragging that he would finish the job he started. 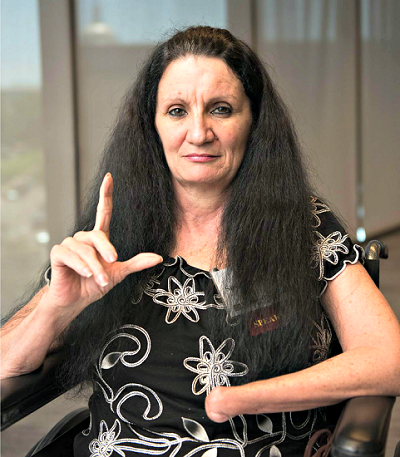 Sirley Avila Leon is asking democratic representatives, human rights organizations, and members of international organizations and all people of goodwill to urge the Cuban government to investigate the threat made against her son and mother. Sirley Ávila León was a delegate to the Municipal Assembly of People’s Power in Cuba from June 2005, for the rural area of Limones until 2012 when the regime gerrymandered her district out of existence. The Castro regime removed her from her position because she had fought to reopen a school in her district, but been ignored by official channels and had reached out to international media. Her son, Yoerlis Peña Ávila, who had an 18 year distinguished career in the Cuban military was forced out when he refused to declare his mother insane and have her committed to a psychiatric facility. Sirley joined the ranks of the democratic opposition and repression against her increased dramatically. On May 24, 2015 she was the victim of a brutal machete attack carried out by Osmany Carriòn, with the complicit assistance of his wife, that led to the loss of her left hand, right upper arm nearly severed, and knees slashed into leaving her crippled. Following the attack she did not receive adequate medical care and was told quietly by medical doctors in Cuba that if she wanted to get better that she would need to leave the country. On March 8, 2016 she arrived in Miami and began a course of treatments over the next six months during which she was able to walk once again although still limited due to her injuries. She returned to Cuba on September 7, 2016 only to find her home occupied by strangers and her attacker free and bragging that he would finish the job. She moved in with her mother and within a short time a camera and microphone were set up across from her mother's home on a post. Threats against Sirley's life intensified leading her to flee Cuba to the United States and request political asylum on October 28, 2016. Below is a video in Spanish explaining the circumstances that led her to leave Cuba. Eduardo Cardet Concepción, prisoner of conscience and Christian Liberation Movement national coordinator, was sentenced to three years in prison today. Meanwhile at the United Nations Human Rights Council his plight was referenced in an oral statement by Hillel Neuer of the nongovernmental organization UN Watch. Speaking out for the Cuban dissident drew an angry protest from the Castro regime's diplomats that interrupted the courageous speaker. Listen to Yaimaris Vecino's testimony in Spanish. Eduardo Cardet has been jailed since November 30, 2016 for speaking critically of Fidel Castro following his death. Amnesty International declared him a prisoner of conscience on January 31, 2017. Today we ask: Is the world living up to the Vienna Declaration, which reaffirms basic human rights? We ask the government of Turkish President Erdogan, if it cares about human rights, why did they just fire more than one hundred thousand teachers, university deans, judges, prosecutors, religious figures and public servants? We ask Pakistan, when will they release Asia Bibi, the innocent, Christian mother of five, now on death row on the absurd charge of blasphemy? We ask Saudi Arabia, when will you end gender apartheid? When will you stop oppressing all religious practice that is not Wahhabist Islam? When will you release Raif Badawi, serving 10 years in prison for the crime of advocating a free society? We welcome the Secretary-General’s new pledge of UN reform. That is why today, pursuant to Article 8 of Resolution 60/251, we call for the complete removal of Saudi Arabia from this Council. So long as 1.3 billion people are denied their basic freedoms, we call for the removal of China. So long as human rights are abused by Bangladesh, Bolivia, Burundi, Congo, Egypt, Iraq, Qatar, and UAE, we call for their removal. So long as the Maduro government imprisons democracy leaders like Mayor Antonio Ledezma of Caracas, and causes its millions of citizens to scavenge for food, we call for the removal of Venezuela. 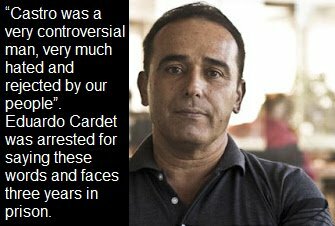 So long as the Castro government jails Eduardo Cardet, a prisoner of conscience, we call for the complete removal of Cuba from this Council. Mr. President, we have the right to cite the suspension provision of this council’s own charter. They can silence human rights defenders at home, but they cannot do so at the United Nations. It began 14 years ago today, the massive roundup of dissidents by the Castro regime's secret police. Their crimes? Some had organized a petition drive, legally recognized within the existing constitution; others were independent journalists or human rights activists. Over a 100 were rounded up but 75 would be subjected to political show trials and sentenced to lengthy prison terms ranging up to 28 years in prison. Amnesty International recognized them all as prisoners of conscience. The Cuban dictatorship thought it had crushed the Cuban democratic opposition, but they were wrong. In the midst of the crackdown emerged a new and formidable force: The Ladies in White. The mothers, wives, sisters, and daughters of the 74 men imprisoned organized into this movement that began to march through the streets of Cuba following mass on Sundays, organizing literary teas, and strategizing how to nonviolently free their loved ones. One woman was condemned to prison in the 2003 Black Spring and she was sentenced to 20 years. Despite the slanders, death threats, beatings, and broken bones by 2011 all of the 75 political prisoners, who became known as the "group of the 75" where out of prison. Most were sent into exile but 12 who held out to the end remain in the island and today continue the struggle and the others now outside, who still live, press on for a democratic transition in Cuba. Looking back fourteen years ago there is a documentary The Black Spring La Primavera Negra filmed in Cuba before and after the crackdown that captures that moment in time. Filmed by Czech - Chilean journalist Carlos Gonzalez. 2. 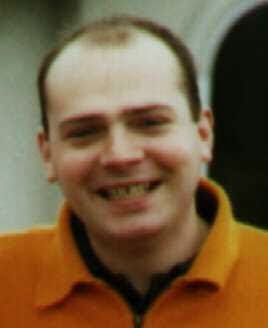 Osvaldo Alfonso Valdés , age 38, 18 year prison sentence. 12. Eduardo Díaz Fleitas, age 51, 21 year prison sentence. 15. Oscar Manuel Espinosa Chepe, age 62, 20 year prison sentence. 16. Alfredo Felipe Fuentes, age 53 26 year prison sentence. 25. Edel José García Díaz, age 57, 15 year prison sentence. 52. Arturo Pérez de Alejo Rodríguez, age 52, 20 year prison sentence. 59. Blas Giraldo Reyes Rodríguez, age 46, 25 year prison sentence. 69. Fidel Suárez Cruz, age 33, 20 year prison sentence. A number of additional dissidents were reportedly arrested during or around the time of the crackdown. The organisation is currently gathering information on their activities, the circumstances of their arrest and their current legal status, in order to determine if they too should be considered prisoners of conscience. They include Rafael Ernesto Avila Pérez, Javier García Pérez, Félix Jaime González Martínez, Rolando Jimenes Posada, Rafael Millet Leyva, Miguel Sigler Amaya, Pablo Solis Cubilla and Orlando Zapata Tamayo. 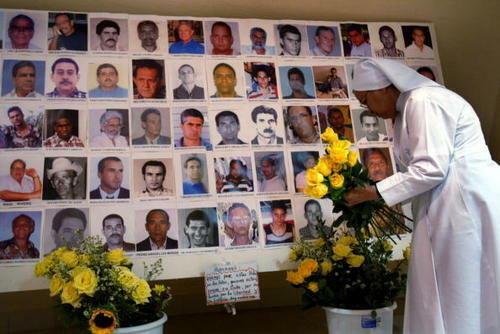 Fourteen years later and the founder of the Ladies in White died under suspicious circumstances in 2011 and Oswaldo Payá Sardiñas, who many asked at the time why he was not jailed in 2003, was killed in what appears to have been a state security engineered "accident." In two days the individual who was elected to head the Christian Liberation Movement, Eduardo Cardet, who has been jailed since November 30, 2016 is expected to have his three year prison sentence confirmed by the Castro regime. Why the Cuban government in 2017 is still a totalitarian dictatorship. This morning Rolando Rodríguez Lobaina founding member of the Eastern Democratic Alliance and founder of the audio visual project Palenque Visión unveiled the documentary POLITICAL PRISONERS IN CUBA Avatars of the Family PRISIONEROS POLITICOS EN CUBA Avatares de la Familia at the Bacardi House at the University of Miami co-hosted by the Center for a Free Cuba and the Institute for Cuban Cuban American Studies. There was a brief introduction, followed by a showing of the 29 minute 16 second documentary and a discussion after the documentary between Rolando and the audience. The importance of this documentary is that it reveals the Castro regime's apparatus of repression targeting friends, family and neighbors of dissidents with the aim of isolating all that dissent from the official line with escalating consequences that can end in prison or death. These consequences are not restricted to the individual dissident but target his or her entire social network. This documentary is an important work that exposes the existing totalitarian nature of the Castro regime in 2017. Rolando has been detained by Cuban State Security over a 100 times over the past 31 years as an opposition activist and also spent a total of six years and two months in prison on three separate occasions. At the same time the documentary filmmaker explained how state security had opened a case file against his nine year old son and was already targeting him at school. Harassment and exclusion are a starting point in a sinister strategy that seeks to destroy socially, and some times physically, those who disagree with you. The full documentary is now available online to all. Hopefully an English subtitled version will be available to reach a greater audience. Sixty years ago today in the afternoon, a group of young men took up arms and charged into the presidential palace in Havana to assassinate the Cuban dictator, Fulgencio Batista, and were all gunned down. Nearby at the same time in Radio Reloj not knowing that the assault had failed student leader José Antonio Echeverría declared the dictator dead only to be himself killed in a skirmish after leaving the radio station. It was described as the day that Cuba lost its future. Six decades later both sides in the ongoing struggle declare José Antonio Echeverría as one of their own. However, his democratic credentials and history as an elected student leader and practicing catholic would place him at odds with the Castro dictatorship. 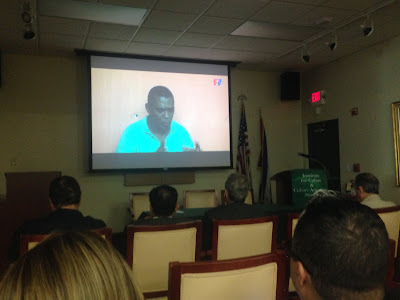 Jose Antonio's sister Lucy Echeverría on August 27, 2014 spoke at a panel discussion, "The Urban Insurrection Against Batista: The Life and Times of Jose Antonio Echeverria" at Florida International University about her brother's leadership at the University of Havana: "My brother held the presidency of the Federation of University Students (FEU) four times elected by overwhelmingly majorities. There the troubles began with Castro. As he never became president, he always kept that inside." Not mentioned in the Castro regime's official press is how the Echeverria family rejected the Castro regime's totalitarian turn to dictatorship and ended up in exile by 1961. According to Lucy, objects found in the Birthplace Museum of José Antonio Echeverría in Cárdenas do not belong to her brother. She also explained how a televised tribute by the dictatorship in Cuba, had imposters play the supposed parents of the martyred leader, while the real ones were already exiled in the United States. Nevertheless, the legacy of the "13 de Marzo" action to overthrow Fulgencio Batista by violent means ended with the deaths of many good and brave Cuban democrats, José Antonio among them, opening the way for Fidel Castro and in hindsight can be seen to have been a disastrous idea. Michael Nagler, a long time peace scholar, presents the theorem as follows: Nonviolence sometimes “works” and always works, while by contrast, Violence sometimes “works” and never works. Nagler offers a more detailed explanation. Unfortunately, the "13 de Marzo" also has another and related significance in Cuban history. Twenty three years ago this upcoming July 13, 1994 a tugboat named the "13 de Marzo", in honor of that violent anniversary, carrying Cuban families seeking to flee the Castro dictatorship, that replaced Fulgencio Batista in 1959, was attacked by agents of the current dictatorship and 37 were killed among them 10 children.